Microsoft’s high profile Xbox One releases are relatively few and far between at the moment, so it makes sense to promote the hell out of PlayerUnknown’s Battlegrounds and take advantage of the title’s console exclusivity for now. 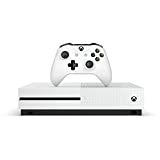 So, later this month on February 20th, 2018, there will be a 1TB white-colored Xbox One S PlayerUnknown’s Battlegrounds bundle hitting retail for $299.99. It will include the console a full game download of PUBG, a 14-day XBL Gold trial and a month of Xbox Game Pass. See the announcement below and at the Xbox Wire site. 14-day Xbox Live Gold trial so you can experience the most advanced multiplayer network.